Parish Councils have their origins in Saxon and Norman times. Villages were ruled by the Lord of the Manor and sometimes the villagers all met to make decisions which affected the whole community. Parish Priests and later Schoolmasters took on roles of leadership and by 1601 Church Vestry Meetings were given the responsibility of levying the poor rate. These were the first effective local taxes. There have been 25 Acts of Parliament over the last two centuries conferring, directly or indirectly, various powers on Parish Councils including Gladstone's 1894 Local Government Act which established them in their modern form as the third tier of Local Government and the 1972 Local Government Act which revised their role substantially. 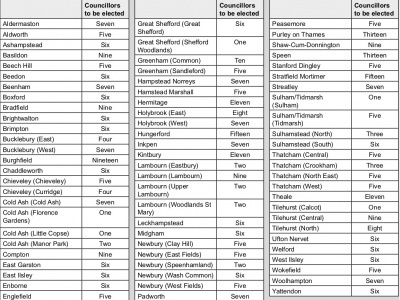 Parish Councils are the lowest tier of government in England and provide the statutory tier of local government closest to the people. It is a corporate body with a legal existence of its own quite separate from that of its members. Despite the name, they have no formal links to the Church of England ecclesiastical parishes and their Parochial Church Council. The Parish Council is responsible for a 'parish' - a relatively small area enclosing one community (see our Parish Boundary map). If the community is sufficiently large, the council may be called a Town Council. In some small parishes (e.g. Wasing) there is no Parish Council, just an annual Parish Meeting. 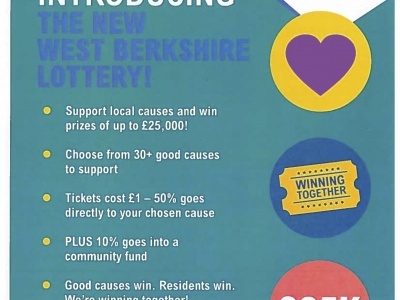 The next tier of local government in our area is the Unitary District Council, in our case, West Berkshire District Council. It has the powers of a non-metropolitan county and district council combined. The funding of Parish Councils for their limited range of services is via an annual "precept" which, is added to the annual District Council's precept plus the Police and Fire Authority charges. 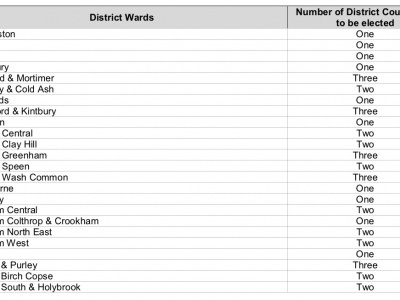 This is collected by the District Council from residents, as the Council Tax. What Parish Councils are not? Whilst a Parish Council can exercise influence, it does not have the final say in some matters such as planning, for example, where the ultimate ruling can go right up to the Secretary of State for Local Government and Communities! Your Parish Council will represent you to the best of its ability - it is neither political nor sectarian. Each parish council has a limited amount of powers and duties. A summary of the acts of Parliament and powers that apply to Parish Councils can be found (here). In addition to specific powers and duties, a parish council can do anything provided that it is for the general benefit of the community this is known as S137 monies. In any one year, this spend should not exceed a sum per elector in the parish, determined annually by the Department for Communities and Local Government. For 2015-16 this sum is £7.36. There is now also a new power called "The Power of Well Being" which was extended to local councils in 2008 this enables them to become involved in more projects and initiatives in their communities. Over the last ten years Woolhampton Parish Council has used the powers and duties available to it to improve the facilities and services in the village. In 2005, we established, at a cost of £11,000, our current allotment. These were built to a high specification following consultation with our allotment tenants. As Custodial Trustees of the Village Hall, we led a project to build a new £450,000 village hall. The hall opened in 2006. As part of the design stage, of this project, the village and the users of the old hall were consulted; this resulted in changes being made to the architect's original proposals. In 2009, we installed at a cost of £23,000, the current village playground. At the design stage of this project we engaged with the parents of village children and the local 'Mothers and Toddlers group'. We have established through lease of land from Wasing Estates, a recreation ground in Station Road, complete with goal posts and nets. Other powers and duties used have provided the village with three new salt bins in areas that are known to be trouble spots, or that are on dangerous bends or on steep hills in the village. We have repaired / replaced two benches (Woolhampton Hill and Woolhampton Lock). We have established three notice boards in the village (Village Shop, Sunhill Layby and Upper Woolhampton). We have restored the Council owned 'Village Fountain which has listed building status. In 2014, at St Peter's Church, in time to reflect upon the 100th Anniversary of the commencement of the First World War, we restored the Village War Memorial. Acting as a 'lobbying body' we have secured from West Berkshire Council highway /safety improvements including a road crossing and traffic islands. We successfully ensured that, as part of the Abbey Gardens development, S106 education monies have been assigned to all schools attended by village children. We continue to lobby Thames Water for sewer improvements in the village. Recently we have successfully persuaded Network Rail to redirect their safety alarm at Midgham Station to avert a long standing noise pollution issue. You will find minutes of meetings on the website. The public is advised that the minutes published in the agenda pack, on the website, are at draft, as such, they are subject to revision by the Council prior to their approval. Amendments to draft minutes are detailed in the minutes of the following Parish Council meeting. The "Freedom of Information Act 2000", which came fully into force in 2003, gives a general right of access to all types of 'recorded' information held by public authorities. The Parish Council has two main obligations under the Act - to produce/agree to a 'publication scheme' (effectively a guide to what information they hold which is publicly available), and how to deal with requests for information. Woolhampton Parish Council has adopted the Model Publication Scheme to provide information in core classes (here).